In responding to contemporary global changes, interdisciplinary learning has gained worldwide attention in higher education. 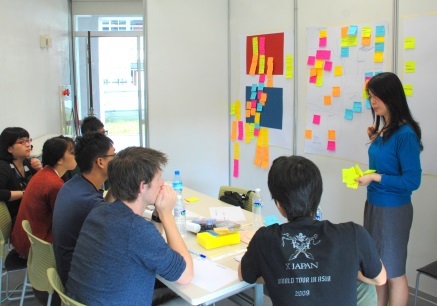 The program office of the Talent Cultivation Program for Smart Living Industry, entrusted by the Ministry of Education, Taiwan, launched the Asian Smart Living International School Initiative in early 2011 to promote the interdisciplinary learning and education in Asian countries. The Asian Smart Living International School (ASLIS) provides experiential learning activities for students in living labs and workshop environment. The curriculum is a student-centered design based on the Double Diamond Model, one of the popular approaches in service design developed by the Design Council in 2005. It is a simple graphical method of describing the design process, and is divided into four design phases: Discover, Define, Develop, and Deliver, which maps the divergent and convergent stages of the design process. The Asian Smart Living International School has already held in Taiwan twice, one from November 30th to December 4th in 2011 and the other from October 10th to 14th in 2012. The school aims at introducing leading international scholars specialized on interdisciplinary living lab methodology to international postgraduate students in order to enhance students’ cross-cultural experiences in smart living innovation. 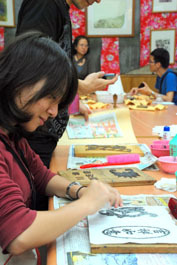 Themes of the 2011’s program were to explore the connection between West and East and between youth and the elderly. The program included Z.E.N, Beyond Aging, More than Biking, and Neverland workshop. 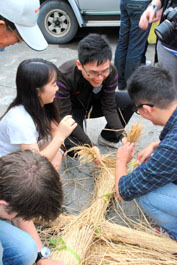 Three living lab courses helped students to address issues of contemporary use of ancient wisdom, active aging with a forever young heart, and alternative future of rural industry. The final workshop, Neverland, connected learning experiences in three living labs and facilitated students to generate novel ideas for problem solving and to deliver concept design. The main focus of ASLIS2012 was "Redesign for Sustainability.” Issues of sustainability and problems faced in rural societies were introduced to students via site visits and field investigation. 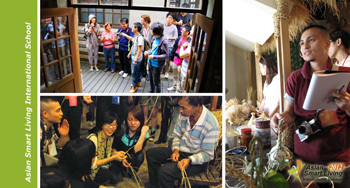 The living labs chosen for this year were three small communities in Yilan with distinct community economy of vernacular craft: Baimi Clogs Village, Jenju Village Community, and Greater Erjie Community. Students spent time experiencing and exploring the three living labs to observe, experience, and learn about the environment, history, culture, and economic background of each lab. They had opportunities to interact with local residents and masters of traditional industries. Moreover, students had to assess the actual needs, resources, and developmental goals of the communities. The above learning processes successfully brought in the innovation of new craft materials, the fine-tuning of end products, and the utilization of mobile technology for tourists into the final workshop, Neverland 2.0. The Asian Smart Living International School has already verified the potential of the new and interdisciplinary education method of active learning. For additional information, please also refer to The ASLIS2012 official website (http://aslis2012.blogspot.com/2012/06/programs.html).